Introduction To Working With Kettlebells….Kettlebell workouts have dramatically grown in popularity over the last few years, as they provide many advantages over standard training methods. These round weights with heavy handles were developed in Russia, and they’ve been around for more than a century. Yet, they are seen as the future by many experts, as they provide several distinct advantages over dumbbell routines….read on to find out the history and benefits of Kettlebell Workouts, then check out the “You Might Also Enjoy” links at the bottom of each article page which will lead you through a total of 45+ pages of top kettlebell exercises whether you are new to kettlebell workouts, an intermediate or an advanced kettlebell user. For easy access we have collected ALL the articles together within an ebook which you can purchase for just $4.99….CLICK HERE to buy now. Kettlebells were first used for physical conditioning in 18th century Russia, where they are called ги́ря (girya), and were employed by the Soviet Red Army in the 20th century as part of strength and conditioning programs. Kettlebell programs were popularised in the USA around the beginning of the C21st by Pavel Tsatsouline, who also developed the first certification program for kettlebells. Kettlebells differ from conventional dumbbells by virtue of the fact that their weight is located some distance underneath the handle, which is also thicker than that of most dumbbells. 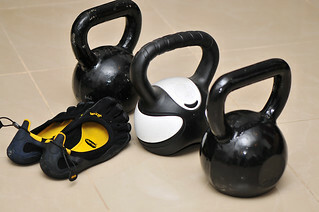 As a result, kettlebells are more difficult to move around and grip. This increased difficulty stimulates more muscle activity contributing to increased burning of calories during resistance exercise. Kettlebells lend themselves more readily than dumbbells or barbells to exercises involving swinging and ballistic movements, and therefore a greater number of muscle areas can be worked within the one exercise (compound exercise as opposed to isolation). There are many exercises using kettlebells which are suitable for people with varying levels of experience and skill. This catalogue of kettlebell exercises provides a range of exercises for beginners, intermediate and advanced students. Because kettlebell exercises differ considerably from other resistance and weight-bearing exercises for reasons outlined above, care should be taken by those beginning a program involving them. A qualified personal trainer or fitness class instructor who has experience with (and, ideally, certification with) kettlebells should select, demonstrate and monitor appropriate exercises for the beginner. Those who are accustomed to training with heavier weights, such as used in hypertrophy programs, should bear in mind that the vast majority of kettlebell exercises are compound rather than isolating in nature, and often involve explosive movement. Therefore a lighter weight of kettlebell should be selected to begin with, and heavier kettlebells should not be used until perfect form is achieved with the lighter ones. Anyone with back and shoulder problems, or a weak core, should consult a physician or appropriately qualified medical practitioner before commencing an exercise program involving kettlebells. When exercising with kettlebells, a clear working space of around 3m or 9 ft is ideal. Kettlebell exercises place great demands on joint flexibility and strength as well as coordination. Therefore warm-ups for kettlebell routines should include specific stretches and engagement of all joints: wrists, elbows, shoulders, hips, knees and ankles. These stretches should be made up of a combination of static stretches (up to 2 minute holds), “ballistic” stretches (a number of repetitions moving in and out of end ranges, e,g. lateral straight punches) and coordination exercises which integrate lower and upper body movements (e.g. jumping jacks).